Last week I watched a documentary on television about the death of Vincent van Gogh. You have probably seen something similar or read a book on his somewhat mysterious death. Did he commit suicide? Was it an accident? Was he murdered? Why was the gun never found? What, if anything, did Doctor Gachet have to do with his death? Why did both Doctor Gachet and Vincent’s brother Theo allow Vincent to lie in agony for three days at his lodgings with the bullet still in his body rather than rush him to hospital to have it removed? However the subject of my blog today is not about Van Gogh’s death. During the documentary it showed a portrait of the great artist and said that it was Van Gogh’s favourite depiction of himself. What really stimulated my curiosity was to hear that the portrait was completed by a friend of his, an Australian painter by the name of John Peter Russell. 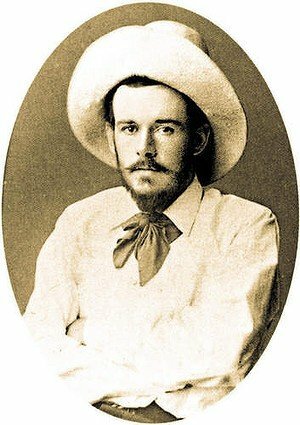 I had never heard of this artist and I could not comprehend how an Australian artist could feature in the Dutchman’s life and so I decided to find out more about him. In this first of my two part blog on Russell I want to look at his early life and a couple of his portraits including the one of van Gogh. So come with me on a voyage of discovery and learn about how a former foundry worker in Australia came to paint a portrait of the great Dutch Master. The story begins at the beginning of the 19th century in Kirkcaldy, Scotland. It was here that John Peter Russell’s grandfather, Robert Russell, had his foundry and engineering works. Robert and his wife Janet Russell (née Nicol) had eleven children, one of whom, John, was our featured artist’s father. In 1830 Robert’s business hit financial problems due to a downturn in demand and he decided to immigrate to Canada. His intended destination changed on the advice of a friend and instead of heading west to Canada he and his family took the steamer Anne Jamieson and sailed to Van Diemen’s Land (now Tasmania) and arrived in the port of Hobart in June 1832. Robert Russell along with his sons, Robert, Peter and John started up an engineering works in Tasmania which proved very successful. In 1838 in order to expand the business the family moved to Sydney and established the firm, Russell Brothers with an engineering works and a foundry on the banks of the Tank Stream, a tributary of Sydney Cove. John Russell married and English girl, Charlotte Elizabeth Nichol, and they went on to have four children of which John Peter Russell, the subject of today’s blog, was the eldest. He was born in June 1858 in the Sydney suburb of Darlinghurst. John Peter was educated at the Goulburn School in Garrooriagang, a private boarding school for the “sons of gentlemen”. After completing his education in 1876, the eighteen year old travelled to England and was apprenticed at the engineering company, Robey & Co. of Lincoln and eventually became a qualified engineer. It was also around this time that he began to take an interest in sketching and painting. In 1879 John Peter Russell’s father died and left his children a sizeable inheritance. In 1881, John Peter Russell who thanks to his inheritance was financially sound and did not need to continue as an engineer. He decided to pursue his love of art and enrolled at the Slade School of Fine Arts at the University College of London. Whilst at the Slade he studied under the Dijon-born French painter and sculptor, Alphonse Legros. Legros would delight his students by showing them his quick preliminary oil sketches (known as ébauches) of the head portraits he had done and it was this type of painting which grabbed Russell’s interest. In August 1883, after completing his art course at the Slade, Russell decided to set off on his travels. His fellow travellers were his brother Percy, an architect, Tom Roberts, a fellow aspiring artist who would later become a leading figure of the Australian Heidelberg School of Impressionism and who, like Russell, had emigrated with his family from the UK to Australia when he was fourteen years of age. Tom Roberts had returned to his birthplace, London, to study art at the Royal Academy Schools. Another person in the travel party was the physician and friend William Maloney who would later become a Labour MP. Their first port of call was Spain where they encountered two Spanish art students Laureano Barrau, who would become a leading Spanish Impressionist painter and the Catalan painter Ramon Casas who would later be known for his paintings depicting crowd scenes. In 1885 Russell went to live in Paris and for the next eighteen months studied at the Atelier Cormon, which was run by the French painter, Fernand Cormon. It was an “academic” studio in which Cormon endeavoured to instil in his students the necessary artistic “rules” which would ensure that their paintings found favour with the Paris Salon jurists. Many great painters, such as Émile Bernard, Louis Anquetin, and Toulouse Lautrec studied under Cormon during Russell’s tenure. Russell who had studied portraiture at the Slade School of Art was still interested in portraiture and would often paint portraits of his friends and fellow students. 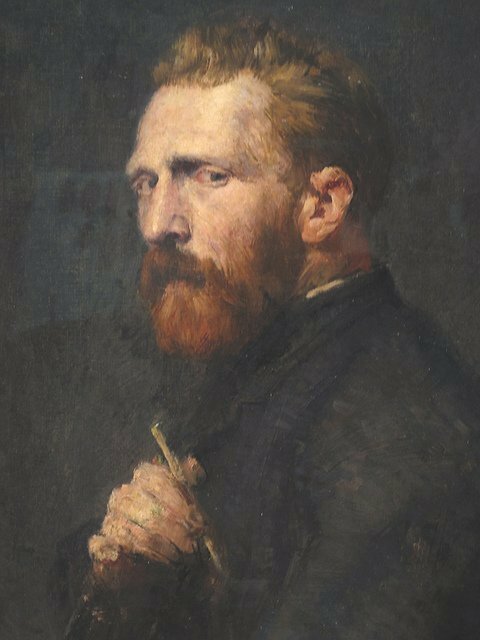 In March 1886 whilst Russell was attending the Atelier Cormon another student enrolled – Vincent van Gogh. Vincent had moved to Paris and went to live with his brother Theo in his apartment in rue Laval on Montmartre in order to study at Cormon’s studio. A great and long-lasting friendship developed between Van Gogh and Russell. In October 1886, Russell finally persuaded Van Gogh to sit for him. The resulting work was the beautiful crafted portrait of the Dutchman which I spoke about at the beginning of the blog. Also according to the Museum curators, a friend of John Peter Russell and van Gogh, the British artist Archibald Standish Hartrick, had seen the original portrait soon after it had been completed and he said that Vincent was depicted in the portrait wearing a striped blue suit ! According to the museum curators there is a hint of blue near the mid base of the work. Russell and Van Gogh were great friends for the short time they were together and after they went their separate ways they continued to correspond. One of the last letters Vincent wrote to Russell on February 1st 1890 just five months before his death and when he was in the mental hospital in St Rémy. 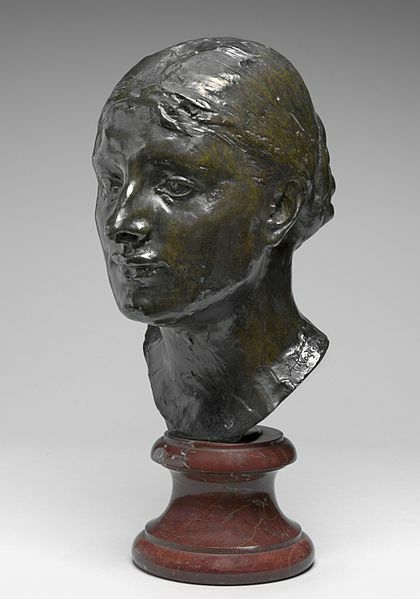 Whilst living in Paris, Russell had become very friendly with two Parisian sculptors, Auguste Rodin and Emmanuel Frémiet and it was whilst visiting their studios that he encountered one of Rodin and Frémiet’s’ favourite models, Marianna Mattiocco della Torre. 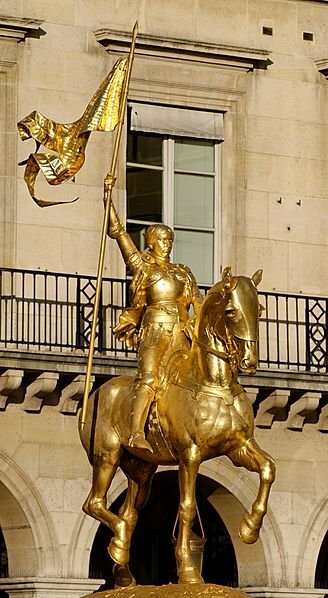 Rodin had, in 1888, encapsulated her beauty in a bronze bust entitled Head of Mrs. John Peter Russell (Marianna Mattiocco della Torre) and Frémiet had used Marianna as the model for his bronze life-sized Jeanne d’Arc statue which is at the Place des Pyramides in Paris. Marianne who was born in Cassino, Italy was in her early twenties when she met Russell in 1885 and three years later, on a cold Parisian day in February 1888, John Peter Russell and Marianna Mattiocco became husband and wife. By the end of the year the happy couple had left Paris and set up home at Belle Isle, the largest of the Breton islands, off the west coast of Brittany. It was here that Russell had their home built and because he was the first non-Frenchman to settle on the island his house was known as Le Chateau Anglais. The second portrait by John Peter Russell I want to show you is entitled Dadone and was completed around 1900. The question is who or what is Dadone? The word “dadone” I believe, but I am by no means certain, is an old fashioned Italian slang for “ancestor” or literally “old one” and therefore indicates that the subject has some sort of family relationship with Russell. The answer to the question can be found in a double portrait which was painted by Russell a few years later, entitled Les deux Mattiocco which has, at the top of the work, the inscription ‘Maria Peppa-Y-Pascal Mattiocco’. 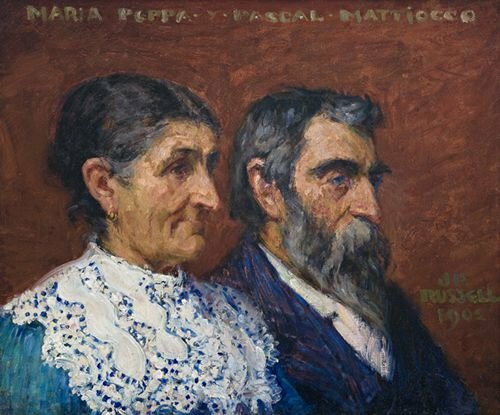 The painting, which depicts an elderly couple, is of Russell’s father and mother-in-law, Pasquale and Maria Mattiocco. The date of the Dadone painting is thought to be 1900 as there is a preliminary sketch for the work in existence, inscribed, ‘JPR 00’ dating it at 1900 and it is thought that the final painting was completed shortly afterwards. The inscription indicates the title of the work, the initials of the artist and the word “fecit” meaning he or she made it and the word is used formerly on works of art next to the artist’s name. This beautifully crafted portrait by Russell is an affectionate and personal depiction of his wife’s father. The main colours used by Russell in this work are white, blue and greys profile. 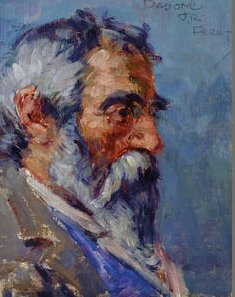 The bony structure of his head is framed by the imperious greying hair and beard, which along with dark bushy eyebrows give his father-in-law such a distinguished appearance. His eyes are dark and there is a hint of tiredness about them, which has been brought on by age. In my next blog, the second part of my look at the life and work of John Peter Russell, I will examine his newly found interest in seascapes and landscapes once he had moved out of Paris and went to live on the Breton island of Belle-Ile where he met with many artists such as Monet and Matisse. Thank you for a brilliant article on John Peter Russell. I wanted to know more about him after being to the Australian Impressionists exhibition at the National Gallery. Previous Previous post: Amedeo Modigliani. Part 4 – His lovers and the tragic end.